The Nanda Devi & Milam Glacier Trek offered by India Pilgrim Tours is designed to bring you face to face with the natural beauty of the Himalayan region of Kumaon. The trek to Milam Glacier is amongst the best of treks in the region and takes you to some of the remotest areas offering breathtaking panorama. Once you’ll reach the glacier, you’ll feel besotted by the splendor of the majestic Mt. 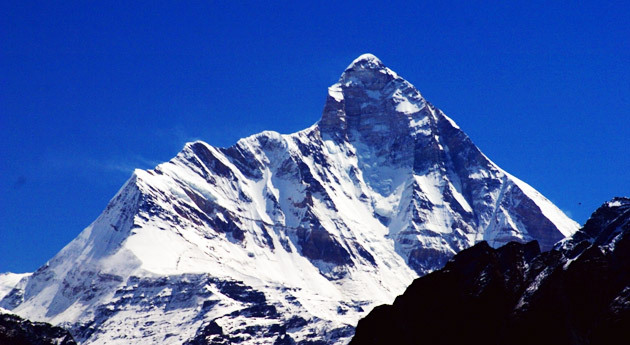 Trishul (7070 meters) which guardians everything in its vicinity. Upon your arrival in Delhi from your State/country of domicile, our tour representative will meet you and assist you in smooth transfer to the Old Delhi Railway Station. Next morning, you will reach at Kathgodam. Stay overnight in the hotel. On the day 2, you will arrive in Kathgodam and later leave by road for Munsyari via Almora. Located in the Nainital district of Uttarakhand, Kathgodam is a part of the twin township of Haldwani-Kathgodam. The town is home to several temples such as ‘Sheetla Devi’ and ‘Kalichaud’. Upon your arrival in Munsyari, check into the hotel for overnight stay. The day 3 kick starts with a 10 kilometers drive to the Selapani village, which is home to a couple of shops. Here you will meet our trekking team and ponies. The trekking route from Selapani descends to the village of Darkot. From Darkot, the trail descends further to the Gori Ganga and continues to the village of Jimigad. The trekking trail continues slowly for a couple of minutes and finally ascends to reach Lilam. Stay overnight in the hotel. Today, the first thing you will do is to report at the ITBP (Border Police) check post. Later, you will cross the post, slowly and steadily, to reach Rupshya Bagar. The trail is full of enthusiasm and gut wrenching experience. The trail weaves through the amazing landscapes, beautiful forests and gorges. The trail continues further to the confluence of Gori Ganga and Ralam River from Ralam Glacier. From here onwards, a straight climb will be followed by a gradual trail towards a new colony at Bugdiar. Before starting your trek to Bugdiar, complete all formalities at ITBP check post. After completing the formalities, proceed to witness the meeting of Gori Ganga and Poting River. 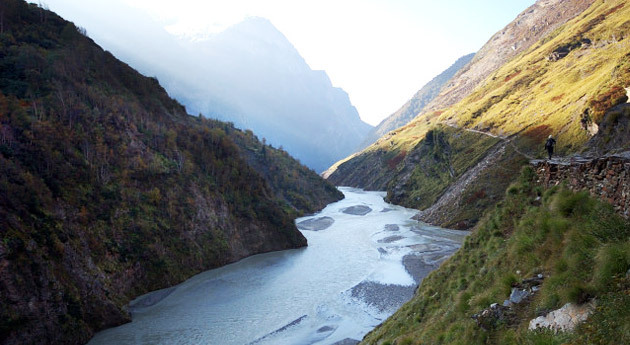 Once you’ve crossed the Poting River, a small descend will bring you to the campsite by the river Gori Ganga. Stay overnight in the tent. Today, start your trekking trail from Bugdiar towards Nahar Devi along the right side of the valley. One can enjoy spectacular views of the gushing river Gori Ganga as the trail passes through rock formations. From here onwards, it is a gradual ascend to reach Mapang followed by Railkot. Here you’ll have to report at ITBP and continue your trek further to Martoli. From Railkot, it’s initially a straight climb to the ridge and later to the village of Martoli. Stay overnight in the tent. Today, the trekking trail from Martoli will bring you down to the bridge over Lwan Gad. Once you’ve crossed the bridge, take an ascent which soon flattens and the journey continues towards another bridge on Goriganga. From here, a steep trail goes up to the village of Burfu. Later, another trail continues towards Milam. The trekking trail is slow and takes you to the Beju village, which overlooks Ganghar and Pachu Valley on the opposite end. One can enjoy spectacular views of Nanda Devi Peak from here. The valley is wide and makes you witness Milam village and the towering Hardeol Peak. Later, you will see the confluence of River Gori Ganga from Utha Dhura. The trail continues to a bridge and following a steep climb you will reach the village of Milam. There is a check post of ITBP where you will report and later continue to the abandoned village of Milam. Stay overnight in the tent. Early morning, start your trek towards the Milam Glacier. 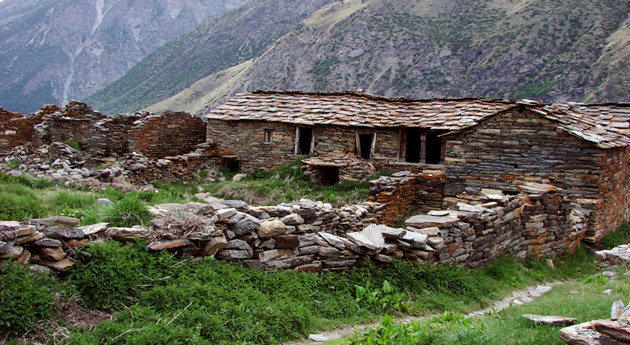 The trail passes through the deserted houses of Milam Village. Initially, the trail is well-marked but as you approach the glacier, it transforms into moraine and stones. Upon your arrival in Milam, explore the glacier and view the towering peaks of Rishi Parvat (6692 meters), Trishuli (7074 meters) and Hardeol (7151 meters). Later, trek back to Milam Village. In the afternoon, relax and explore the historic structures at Milam, which is an important trading centre between India and Tibet. The trekking trail from Milam to Martoli village is a quiet easy. You’ll have to pass through the villages of Burfu and Belju. Later, it is a steep ascend from Lwan Gad to reach the village of Martoli. The village of Martoli is deserted but there is a traditional temple of Mother Nanda Devi and a few old houses which serve as hotels and lodges to the travelers. Stay overnight in the tent. The trek begins on the right of the valley with the excellent views of Nanda Devi East dominating the horizon. The trekking trail passes by beautiful meadows and go through descends and ascends until you reach the abandoned settlement at Lawn. Stay overnight in the tent. The trek to the Nanda Devi East Base Camp is quiet tedious and requires cautious stepping. The landscape is beautiful and scenery is brilliant as the trail passes through a sequence of moraine fields and Sartol Kharak (3650 meters) and Naspanpatti (3850 meters), two famous meadows en-route Nanda Devi. Stay overnight in the tent. In the morning, embark on a trekking trail towards Nanda Devi East. Explore the landscape and return back to the base camp. Stay overnight in the tent. Today, you will start your trek early in the morning. The trek to the Martoli village is a steady descend but one should feel vigilant throughout the hike. Arrive in Martoli where tents are placed for your overnight accommodation. On the 13th day, you’ll start an early trek and pass through Railkot, Nahar Devi and Mapang to reach Bugdiar. Stay overnight in the tent. On the 14th day, the trekking trail will pass through Sunni, Rupshya Bagar and Rargadi and bring you to the village of Lilam. Stay overnight in the tent. Today is your last day of trek that will take you to Selapani Village, which is located at a distance of 3 hours. From here onwards, a traditional mountain jeep is required to reach Munsyari. Upon arrival, check into the hotel/guest house. Stay overnight in the hotel/guest house. Early morning, leave by road to Kathgodam to board Ranikhet Express for Old Delhi Railway Station. Overnight journey on-board the train. Early morning, arrive in Delhi followed by transfer to the airport to board flight for onwards destination.